Paris, August 8, 2018 – Internet Without Borders welcomes the position of EU’s Election Observation Mission in Mali in favor of freedom of expression. The mission, led by former Italian Minister Cécile Kyenge, calls on the “Malian authorities to guarantee unhindered access to the Internet and social networks”, in a statement issued on August 7, 2018. 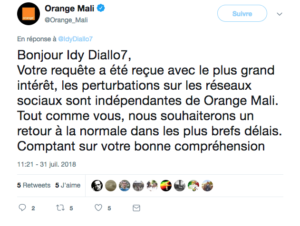 On July 29, 2018, the day of the presidential election, access to the most popular social networks was blocked on the network of the main operator of the country, according to an investigation published by Internet Without Borders and the Open Observatory of network Interference, and reports from Internet Without Borders’ sources in the Malian Community of Bloggers. “The blocking of messaging apps and social media during an election period undermines the credibility and sincerity of the vote. These tools are sometimes the only means that allow the opposition and civil society to collect, centralize and calculate the results, based on pictures of forms tallying the results from polling stations, taken by smartphones.” said Julie Owono, executive director of Internet Without Borders. Internet Sans Frontières calls on the Malian government to take all necessary measures to restore and protect full Internet access during the second round of the presidential election, and encourages election observation missions to pay particular attention to connectivity during the ballot. Malian citizens have the fundamental right to freedom of expression and communication online, especially during elections.